In its customary venue of Camp ASCCA in Jackson’s Gap, Alabama, the Southeastern region of the Atlantic-Pacific Tang Soo Do Federation held a successful and enjoyable Black Belt Camp under the watchful eye of Grandmaster John St. James and Twelve other Masters from a variety of schools around the Southeast. One of the highlights of Black Belt Camp, the test and review in the grand pavilion, produced a high-energy start to the camp for our black belts, while the red and blue belts learned the ways of the camp from Masters Navarra and Watson, as well as those selected to help from the recently finished Instructor Training Symposium held on Friday from 9 am until 4 pm. All candidates and reviewers testing during the Dan Shim Sa showed great Moo Do spirit, but the performance of Ethan Sandberg of Karate World of North Georgia (youth division) and Grace Hartfield of Eagle Leadership Martial Arts Academy (adult division) stood out as exemplary as these two young martial artists got recognized for Best in Test honors. A key to the value of Black Belt camp is the opportunity to learn from new instructors and to explore areas of interest with them. This year brought several fresh and exciting techniques from Masters and Sam Dan-level instructors. Some well-known faces who took active teaching roles this year in areas of specialty were Masters Akong (Hu Ri, use of hips), Sandberg (Kubaton), and Watson-Jones (Kubaton, Escrima). Along with these Masters, other 4th Dan instructors who taught were Matthew Chandler (Sword, Advanced Kicking), and Alex Watson-Jones (Advanced Kicking). Mrs. McGovern and Mrs. Wigmore taught a great conditioning class and offered their skills in leading other classes. Of course, the Masters and school owners continued to offer a wide array of their specialties as well: Carole Smith (Stranger Danger for Kids, Jump Spinning Kicks for Women), Michael Jett (Bong techniques, Joint Locks, and Nunchaku), Stacy Busby (Isometrics, Real Deal Defense), Chris Chisum (Focus Mitt), Rachel Chisum (Knife and Gun), and Chris Watson (Women’s self-defense). Also offering his guidance through teaching advanced hyung to Sam Dan and above, Grandmaster also taught a number of Healing Warrior Society classes including sitting and moving meditation and Chi Gong. Although specialized classes are interspersed throughout the schedule, what makes the camp complete is the coming together of the Federation, which all experienced happily in the cafeteria. As a special opportunity on Saturday night, one chair of each table sat in wait for a Master to come and share a meal and conversation with the students. With extra attention to table manners under the approving eyes of their masters, kids and adults alike were able to enjoy the treat of conversation with those who have walked the path longer. After the longest day of training at camp and a nice meal, Federation members all gathered around for Grandmaster to give us his insights into the seven steps of achieving mastery. In his enthusiastic and earnest style, Grandmaster St. James urged participants and chaperones alike to follow the keys to success in both Tang Soo Do and most importantly life itself. Master Watson-Jones offered a follow-up lesson that called each of us to build our daily lives around what matters most rather than let them fill up with the things that matter least. Finally, Master Chris Chisum offered an off-the-cuff yet highly convincing call for everyone to come to Orlando in July of next year for the International Championships to be held July 19th and 20th at the B Resort and Spa in Orlando right across from Disney World. We all want to become better people, plan for future opportunities, and improve in our skills. Nevertheless, camp just wouldn’t be complete without time to let loose and have fun. While the Masters and school owners attended to a leadership meeting in the executive conference room, a special treat for the kids came on Saturday afternoon. They were able to hang up their dobohks and let loose for a few hours. 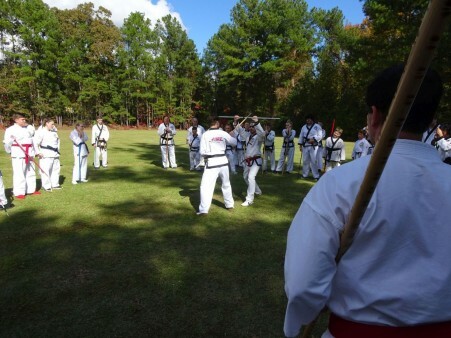 Whether they were zipping through the trees, firing arrows at high speed, or putting golf balls, participants and chaperones had a chance to get out of the focused karate mindset for a while and enjoy other activities with their karate friends. Of course, for those gluttons for punishment and perfectionists, 4th Dan instructors Mr. Darrell Bauer and Matthew Chandler were on hand to help their fellow martial artists refine and improve forms, and Karate World’s tireless duo of Kris McGovern and Chris Wigmore offered a punishing routine of conditioning. As a final recognition to the long traditions of our shared martial art, Sunday brought the experiences of Forms to the Drum and belt promotions. Though many students who have come to expect Bassai as our form were in one sense proven correct, Grandmaster St. James through in a curveball however by having the whole group do Bassai So instead of the more commonly known Bassai Dae. The end result was the group’s best effort at perfection under pressure, and it was a fitting way to end a camp that is full of those moments.